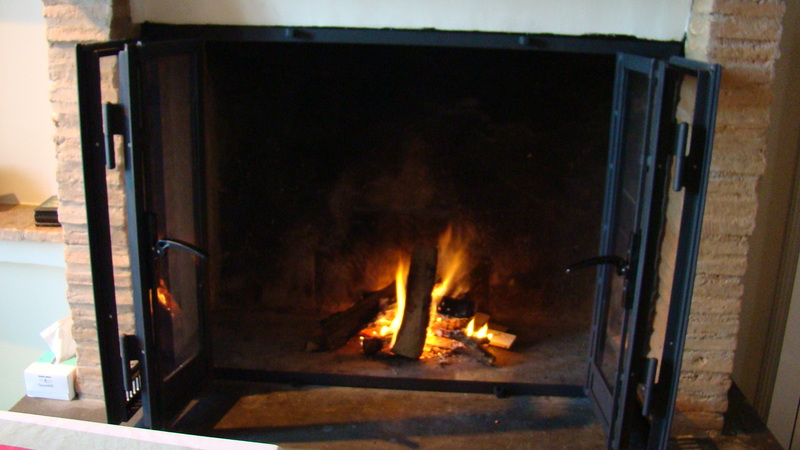 End of Autumn, beginning of winter, fireplace, l’Imacolatta and Christmas! I am very late with this post. It has been pretty busy here. 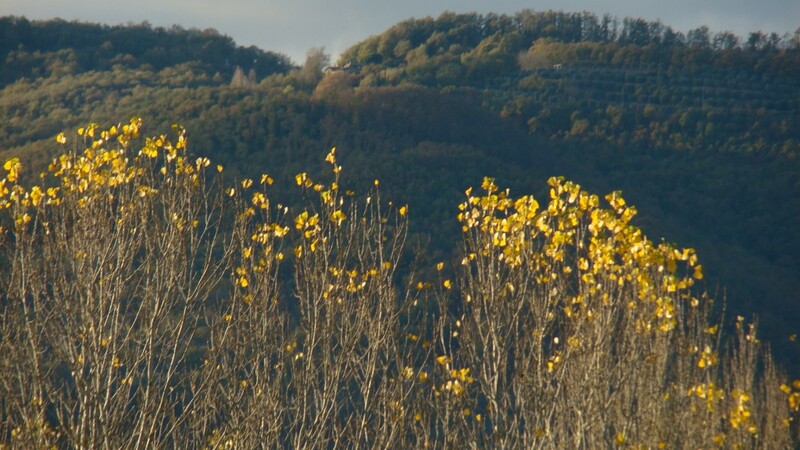 First a final farewell to Autumn color. And a hello to winter. It has gotten cold here. Real wintery. 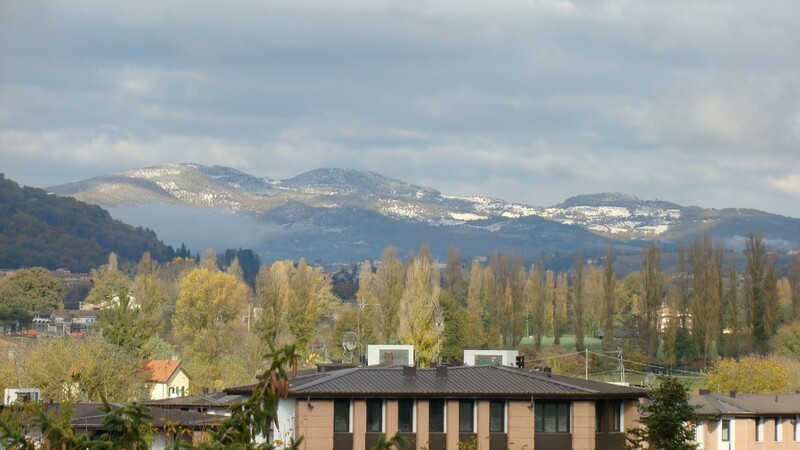 Snow on the distant mountains. Our town Christmas tree looks nice. Smaller but there are more lights. Along with the tree and the lights, Baba Natale came to our town to visit the kids. 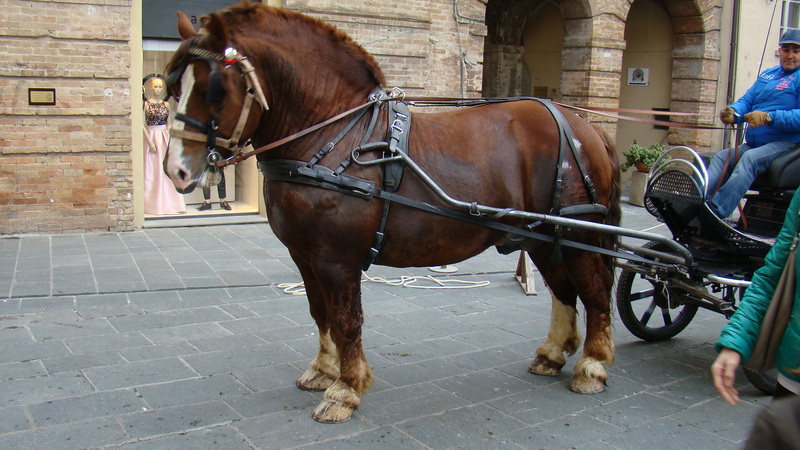 A wonderfully chunky horse pulled the kids in a cart. Isn’t he magnificent? We went for a short break to Chianti last week. Two nights. Pretty there with lots of fall color still. We stayed in Locanda il Gallo in a little town called Chiocchio. Fun to say – chee-ooch-che-ee-oh. It was comfortable and we ate there both nights. Quite good food. We also visited about 5 wineries. 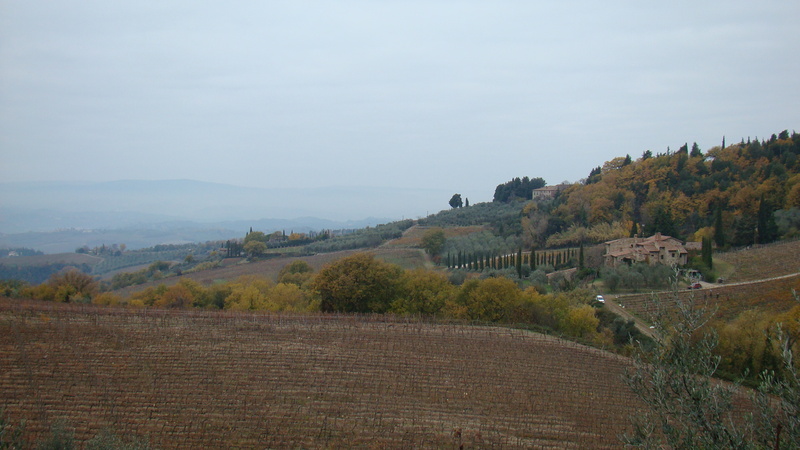 I enjoyed the pretty Tuscan scenery. This picture from one of the wineries. 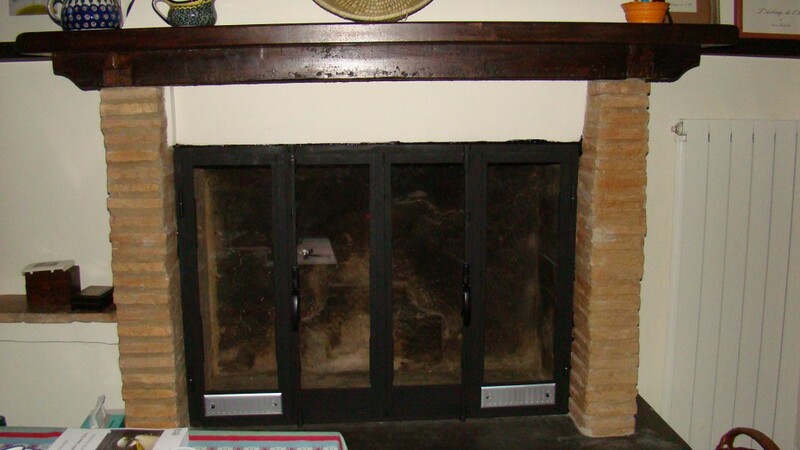 We got our new fireplace doors in the kitchen. Yesterday we built a test fire and it burned pretty well and the chimney drew. We have arranged to buy wood from a friend of ours whose husband who will actually bring it up here to our house. Nice! Also more pellets for the stove and Luther won’t have to tote them up the stairs. Other mundane things. We did a shopping trip to the big IperCoop for supplies and gifts. It was surprisingly empty considering the proximity to Christmas. Never in America! Our downstairs neighbor was so proud that he scored all the “seconds” from the market for free and somehow with the language difficulties I ended up with a crate of apples. Not sure how I can use them up! I made two cakes yesterday and took him one of them. We went for pizza at Calcio e Pepe our new favorite place here in town. They are just so welcoming and Italian! They have great pizza too! They are from Napoli. There were families with many kids there so it was boisterous and happy and, did I mention, Italian?! The proprietors know us and we get many double kisses. December 8 is l’Imacolatta or Day of the Immaculate Conception. We looked it up and discovered we were wrong about what it meant. Turns out it is the day that Mary was conceived to her mother. I had thought it was Jesus’ conception but was confused as it is only two weeks before his birthday. 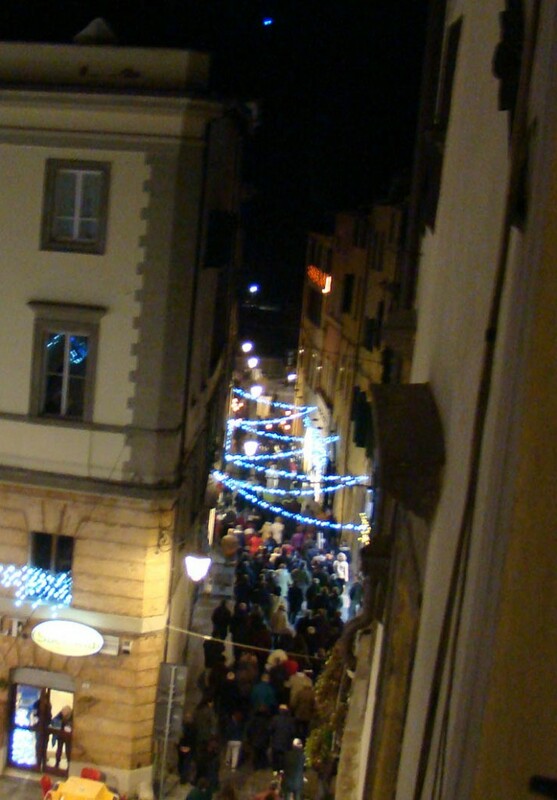 This picture shows the procession of people who walk through the streets following the priests. The band plays music. I leaned out my window to get this. Sorry it’s blurry. And finally, I will be spending the holidays with my sister in Virginia. I am pretty excited about going back to the US after a year and a half. Doing a bit of shopping. Eating exotic things!! Reservations at Raisika (spicy Indian fare) YUM! I am not religious but I still like to wish folks Merry Christmas! Please accept it in the spirit it was offered. Merry Christmas to you all! 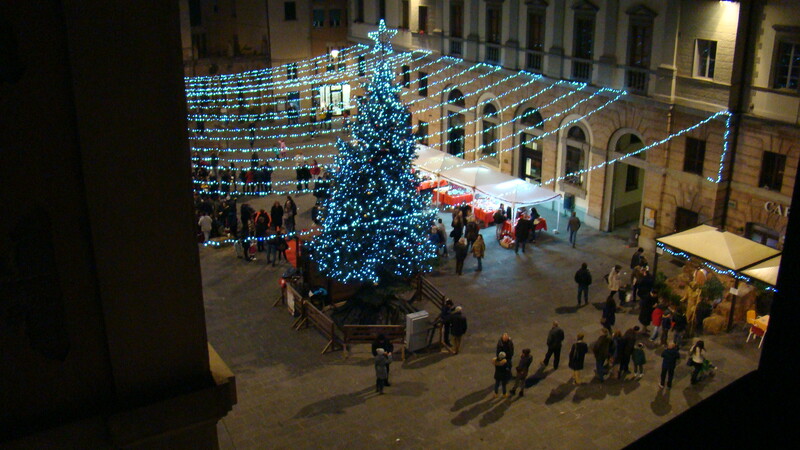 This entry was posted in everyday life in Umbria, Festivals and Sagras, restaurants, Travel on December 13, 2015 by Nancy Hampton.